Summer has made a few appearances already in Alberta and I wasn't expecting the temperatures to get so high so fast. I was caught off guard and was so happy to have the Bioderma Photoderm moisturizing self-tanning mist on hand for a quick color boost without the hassle of a messy foam, mitts, etc. 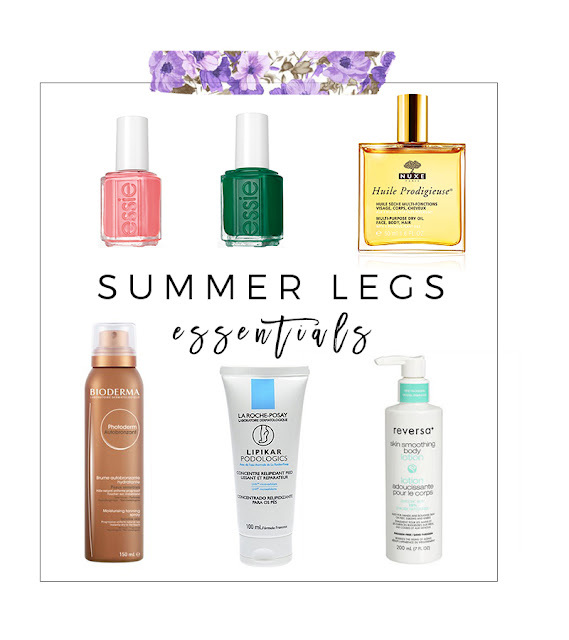 Here are some of my other essential go-to products for pretty legs and feet in the Summer. Essie Summer 2016 Nail Polishes ⊿ while I go polish-free more and more on my finger nails because, mom life, I cannot wear open toe shoes without a bright pedi. Nuxe Huile Prodigieuse Dry Oil ⊿ my favorite quick and easy tip for pretty legs in a few seconds. Just rub some of this luxurious oil on your legs and bam, instant goddess status! Bioderma Photoderm Moisturizing Self Tanning Mist ⊿ I am challenged in the self tanning department and I love how easy this is. I am also happy to report that it does not streak or smell like self tanner. It's a miracle! Lipikar Podologics Foot Cream ⊿ Dry, cracked feet are not cute. This foot cream is absolutely amazing. I repairs cracks and smoothes out skin in a matter of days. Reversa Skin Smoothing Body Lotion ⊿ I sometimes have tiny little red bumps on the back of my arms (keratosis pilaris) and this lotion with glycolic acid treats it, smoothes and evens out the skin. What are some of your Summer beauty must-haves?